Maybe your vision of vinyl is a little dated. If, when you hear vinyl flooring, you see a small choice of colors and a lack of interesting patterns, allow us to paint a totally different picture. Today, vinyl flooring has joined the ranks of tile, laminate and carpeting in offering you beautiful products, a broad spectrum of colors, virtually endless patterns and configurations – options to inspire and fire your imagination. Given that, the goal today is to determine what combination of aesthetics, style and performance best fit your vinyl flooring budget. To help with that, and make you a smarter, more knowledgeable shopper, we created this section. It’s all about vinyl flooring style tips, the advantages and benefits of vinyl, factors to consider when decorating with vinyl and more. Please read on and build your knowledge base on this traditional product that has been transformed into true contemporary flooring. You’ll be floored by today’s vinyl. Today’s vinyl flooring has truly advanced from that of yesterday. Long gone are the shiny, plastic-looking floors that easily dented and ripped. There is now a broad selection of fashionable colors, patterns and textures that offer durability and easy maintenance. Many of these stylish new products emulate the look of natural stone, slate or ceramic tile and can fit into any budget. Vinyl is on the move throughout the home. 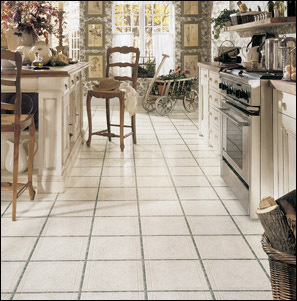 Traditionally, vinyl flooring has been found in your kitchen, bath or laundry room areas. This is because vinyl is a practical, functional and fashionable option for today’s active households. 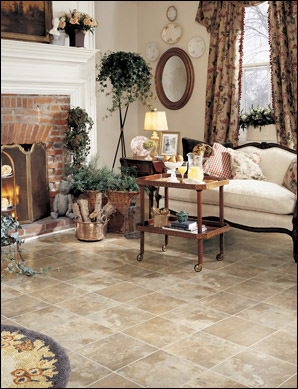 Vinyl is also known to be cushiony and warm underfoot in comparison to natural stone or ceramic tile. But now, thanks to innovations in design and performance, vinyl flooring is at home in any room in your home. So factor that into your planning. With vinyl it’s easy in and easy out. If replacing any flooring may be in your future, keep vinyl in mind. 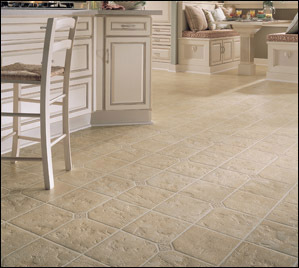 Vinyl floors are much easier to remove than a grouted ceramic tile or natural stone floor. This could potentially save you time and money in the long run if and when replacement is a possibility. As you buy up, the benefits escalate. As you move up in the vinyl flooring price range there are many benefits. In terms of product selection alone, more versatile patterns, colors and textures will be available to you. When talking about performance, today’s premium wearlayers offer superior resistance to stains, scuffs and scratches. That’s worth noting if you live in an active household, or with kids or pets. Some premium wearlayers are enhanced with aluminum oxide, which provides exceptional resistance to scratching. More importantly, these wearlayers make clean up a breeze. Make your life a little easier. You’ll also notice that, as you move up, you’ll get enhanced performance constructions, designed to protect your floor from rips, tears, gouges and permanent indentations. Know this: style is determined by two sizes. When selecting a vinyl pattern, you want to consider the size of the room and the size of the pattern. The decorating rule of thumb still applies to vinyl flooring in relation to room size and color. Lighter flooring colors will make a smaller room appear larger, while darker colors will absorb the light and create a more intimate setting. When working with vinyl flooring pattern sizes, a smaller pattern works well in small areas or in rooms where the pattern will be visually interrupted with pieces of furniture, or a kitchen island. However, keep in mind that larger flooring patterns can sometimes actually visually expand a room. Be aware of your surroundings. When considering vinyl flooring styles you’ll also want to consider any printed fabric on your furniture or wallpaper in the room. If the fabric or wallpaper is a large-scale print you’ll want to look at smaller patterns for the floor. Conversely, if you have a small-scale pattern in the fabric or wallpaper you’ll want a larger pattern for the floor. Take a shine to understanding gloss. Vinyl flooring products come in a selection of gloss levels to suit your needs. Generally speaking, the lower the gloss level, the more forgiving your floor will be to the daily wear of foot traffic. Choose your gloss level accordingly. Style is unique, personal and individual. That’s good. Because today’s vinyl flooring is all that and more. It’s one of the most popular and most economical flooring choices on the market. And if this product is on your shopping list we invite you to read more, know more about it, in the other vinyl sections. We carry a fine selection of floors including carpet, hardwood, laminate, ceramic tile, vinyl, LVT and area rugs. Shop at Home Flooring & Next Day Installation available. Stocking products available for carpet, hardwood flooring, tile, laminate, vinyl, luxury vinyl tile and rugs. © 2019 Creating Your Space. All Rights Reserved.